Google has officially announced Android 5.1 Lollipop, which is a modest, yet welcome update to the world's most popular mobile operating system. In addition to the mandatory stability and performance improvements, Android 5.1 brings support for multiple SIM cards. The new software should make it easier for multiple users to share a dual-SIM smartphone or a single user to take advantage of multiple carriers' services. However, details are unclear as to how is Android 5.1 better at juggling between multiple SIMs. Additionally, we'll get enhanced Device Protection mechanisms in Android 5.1. Long story short, lost or stolen devices will remain locked until the original user logs in with their Google account credentials. The lock remains active even after a factory reset, which is great to hear. 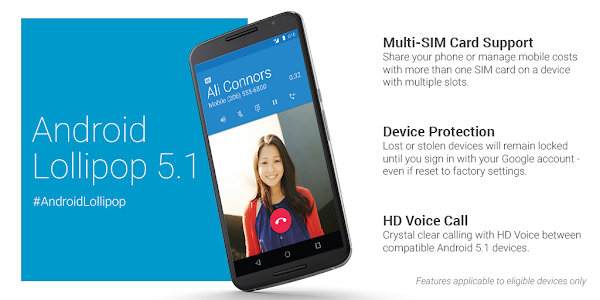 Last but not least, Android 5.1 includes native support for HD voice calls. Owners of compatible phones will be enjoying crystal-clear voice calls, as long as their carrier supports the feature. The Google Nexus 6 on T-Mobile or its upcoming Verizon variant, for example, are among these compatible devices. These are all the major features coming in Android 5.1, pretty much. Along with them, we'll get a few minor ones, including the option to join Wi-Fi networks and control paired Bluetooth devices from the Quick Settings menu. We're expecting details regarding the Android 5.1 release date to arrive in the near future. Chances are that Nexus smartphones and tablets will be the first to receive the new software, followed by the top models from major manufacturers.